The Cowpastures project is a community based collaborative research enterprise which is co-ordinated by UOW historian Dr Ian Willis. It is a long term venture which aims to reveal the intricacies of the Cowpastures district from 1795 to 1850. The Dharawal people occupied the area for centuries. The district was part of the Australian colonial settler society project driven by British colonialism. There was the creation of the government reserve for the wild cattle between 1795 and 1823. After this period the Cowpastures became a regional locality that was in common usage well into the 19th century. 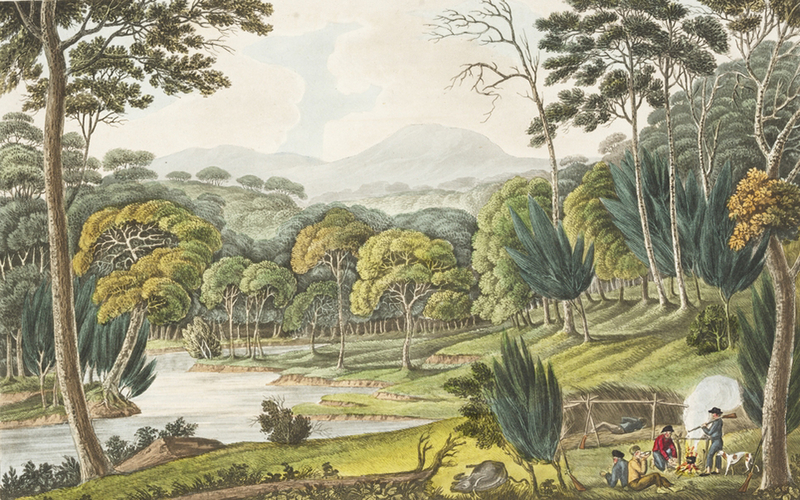 The British aimed the create an English-style landscape from their arrival in the area from 1790s. The earliest written acknowledgement of this by Englishman John Hawdon in 1828. I have published some material and there are a number of blog posts related to the project. James Pearson of Staindrop History of County Durham in England has recently written to the CHN blogger and brought to his attention information about the English origins and connections of John Hawdon of Elderslie. John Hawdon of Elderslie was born in the village of Wackerfield. The village is also known as Wakefield or Walkerfield in Country Durham. According to James Pearson the accent in the north-east reduces this pronunciation to ‘Wackerfield’ and it appears on maps under either spelling. James Pearson writes that Wackerfield sits on the slope of Keverstone bank just above Raby Castle and the ground begins to descend, though not steeply, towards the river Tees. It looks flat area in places and is located on the ‘spine’ of England. The area is on the eastern side of the north Pennine range so areas of moorland. The hamlet of Wackerfield is about half a mile from Raby Castle in County Durham. Built for the mighty dynasty of the Nevills, this great fortress stands proud and defiant, its history rolling back almost a thousand years. King Cnut (also known as Canute II the Great) owned the Estate, then known as ‘Rabi’ (derived from ‘Ra’, Danish for a boundary, and ‘Bi’, a settlement or dwelling) in the early 11th Century. The Viking King and self appointed ‘Emperor of the North’ may well have built a manor house here, but it was the Nevills who built the 14th century castle which still stands today. Raby Castle was the property of the Nevill family and royal connections until 1569 when they led a rebellion against Elizabeth I for which hundreds were executed in the north, a number from every village and town. It then became the property of the Vane family who were prominent in the English Civil War. Raby Castle, the private home of Lord Barnard, sits at the heart of the Raby Estate, which spreads across Teesdale, County Durham and Northumbria. Agriculture is an important source of income for the Estate. As well as the Estate’s own Home Farm in Raby Park, there are many tenanted farms and a large number of houses and cottages in villages around Teesdale, many are whitewashed farmsteads and houses where families have been tenants for several generations. Raby Estates have several residential properties and agricultural holdings which become available from time to time. Houses owned by Raby can be found in many Teesdale villages near Barnard Castle and Darlington such as Staindrop, Piercebridge, Wackerfield and Middleton-in-Teesdale. Wackerield Hall in the main building in the village and there are a number of outbuildings. Today they produce a lot of hay in this area, and during harvest period tractor and trailer loads of baled hay come through the village. John Hawdon of Wackerfield was born in 1770, son of John Hawdon and Mary Watson. He married Elizabeth Hunt of Gainford, a village about three miles away, in 1798. John’s children included sons John (b.1801), Joseph and William (b.1812), who stayed on the family farm. John was a ‘Cornet’ (2nd Lieutenant) in Staindrop Gentlemen and Yeomanry (1798—1815), raised by John Ingram which was renamed as the Staindrop Troop of Volunteer Cavalry, disbanded in 1815. The was cavalry raised in 1798 in the face of a threatened Napoleonic invasion. John was promoted to a lieutenant and eventually served as captain of the troop. The Staindrop Gentlemen and Yeomanry was raised in 1798 by John Ingram of Staindrop, with a strength of 54 officers and men. In 1803, the Regiment changed its name to the Staindrop Volunteer Cavalry. It survived until 1815, when it became part of the Durham Yeomanry. This is a rare surviving example of Napoleonic Volunteer cavalry uniform from County Durham. John Hawdon of Wackerfield died in 1845. John of Elderslie’s parents are buried in the churchyard in Wackerfield and there is a gravestone. John Hawdon, grandfather of John of Elderslie, was born in the parish in 1742 son of Christopher and Ann Hawdon. Christopher was born in 1710 in the same parish. John Hawdon’s farm was 520 acres and is still a working farm with the original farmhouse. It was primarily concerned with breeding and growing sheep. John Hawdon, (b.1770) was a member of the Staindrop Farmer’s Club where they discussed the latest developments in farming and other issues. In 1862 John felt that the steam plough and threshing machine would be a great improvement for farming. John was quite an expert on raising sheep and presented a paper at the Club on the issue in 1863. In 1865 John spoke the Club on the subject of fattening sheep during the summer months. On the death of John Hawdon (1770-1845) in 1845 his third son William Watson Hawdon was in possession of the farm. Brother William (1812-1879) stayed and farmed at Wackerfield. William married and had several sons, one was an engineer, another was a director of ironworks, and one died young aged 16yrs. When William Watson Hawdon died in 1879 aged 67yrs, he had no son in the farming business to follow him. William’s widow left the farm and moved into Ormuz house on the village green and died there in 1891. James Pearson came across a speech their father John Hawdon (1770-1845) gave to the Staindrop Farmers Club in 1844 and he was discussing the breeds of sheep and what is best for the local area. Today the farm has some sheep, dairy farming and some cropping. John Hawdon of Elderslie did duties in the Staindrop Volunteer Cavalry before coming out to New South Wales. John’s younger brother Joseph Hawdon followed his elder brother, John, out to Australia. He too had an eventful life eventually moving to New Zealand where he became famous as an outlander. Brother Joseph had died in 1871 in New Zealand, and brother John of Elderslie was the surviving brother. John of Eldersle returned to England in the late 1870s. James Pearson located an interesting newspaper article about John of Elderslie’s return to England. The local newspaper reported the visit and John’s return to New South Wales in 1880. In the course of a few days Mr John Hawdon, of Wackerfield, will sail for the antipodes, and the last link of a family long associated with agricultural pursuits in this neighbourhood will be severed. Mr Hawdon’s family for centuries have farmed at Walkerfield, and the name is familiar in most market towns in the north. At a period contemporaneous with the reign of Queen Elisabeth the farm at Wackerfield belonged to the Hawdons, the property subsequently having been purchased by one of the lords of Raby, and the farm being now held by the Duke of Cleveland. The lot of the farmer has been beset with difficulties during the past few years. The English agriculturist has had to cope with foreign competition. Bad trade has long depressed all industries, and, what is even more significant to the farmer, bad crops for a succession of years have been reaped. There is every prospect, however, this season, that good crops will uniformly be gathered. Let us venture a hope that in his new home Mr Hawdon may prosper, and that he may soon be surrounded by as many friends as now regret his departure from these shores. S G P Ward (1962), ‘Faithful: The Story of The Durham Light Infantry’ provides an overview of the Napoleonic Volunteers in County Durham. 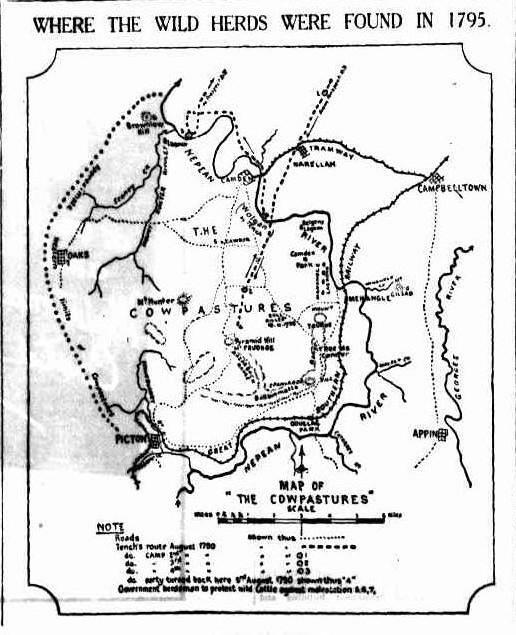 The story of European settlement in the Cowpastures is intimately connected to the story of the convicts and their masters. This story has not been told and there is little understanding of the role of the convicts in the Cowpastures district before 1840. Who were they? What did they do? Did they stay in the district? The convicts were a form of forced labour, with a global history that goes back to Roman times. Amongst those who were landed were human souls who were part of the dark story of banishment and exile. The story of convicts and banishment is an integral part of the European colonialism from the 16th century and the rise of labour camps. The story parallels that of slavery. 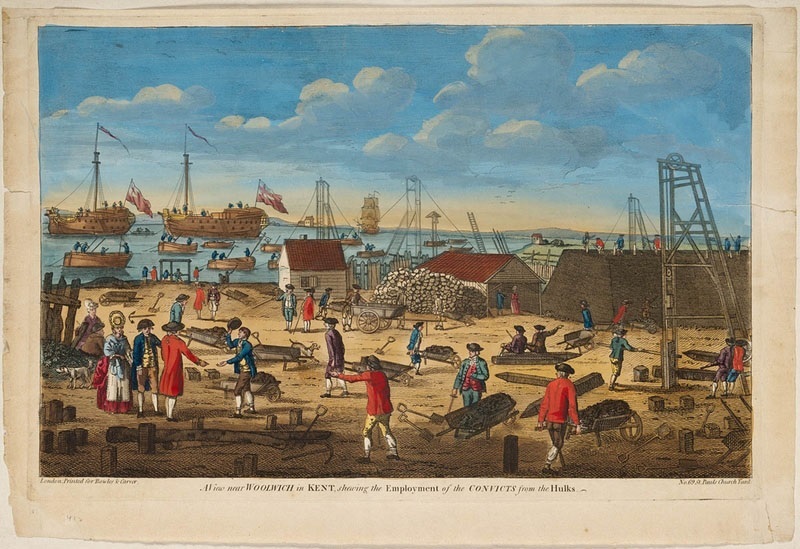 Convicts came to New South Wales after the British lost the American colonies in the revolutionary wars in the 1780s. The convicts that ended up the in Cowpastures district were part of the 160,000 who were transported to the Australian colonies from England, Wales, Ireland and the British colonies. Convicts were usually employed in a number of ways by the colonial authorities: assignment; government work gangs; Tickets of Leave; Conditional Pardon; and an Absolute Pardon with complete freedom to do as they wished including returning to Britain. Generally speaking most convict women could be classified as domestic servants, while male convicts had a host of skills with town trades dominating over rural workers. The literacy rates and skills of convicts were the same or better than the English and Irish working classes. The Cowpastures district was an ill-defined area that included Governor Hunter’s government reserve from 1795. The reserve covered an area that generally south of the Nepean River between Stonequarry Creek (Picton), The Oaks and Menangle to the east. By 1840 the Cowpastures district had become a general locality name that extended north of the Nepean River to include Narellan and Bringelly. The best short reference of the convicts in the Cowpastures is Ken Williams’ 1824 Cawdor Bench of Magistrates Population, Land and Stock Book (2011), where he lists the names and masters. Williams indicates that in the Cowpasture in 1824 there were 430 convicts and of them 15 were women, who were listed as domestic servants. Elizabeth Villy indicates that the stock books indicates 29 landholders, who were mostly absentee landlords. The best account to date of the activities of the convicts in the Cowpastures is Elizabeth Villy’s The Old Razorback Road (2011). She states that in the 1820s in the last days of the Cowpastures Government Reserve there were around 550 convicts assigned to settlers including around 100 at Camden Park estate. These men were employed as shepherds and labourers, who were clearing land, and preparing ground for ploughing and growing pasture. 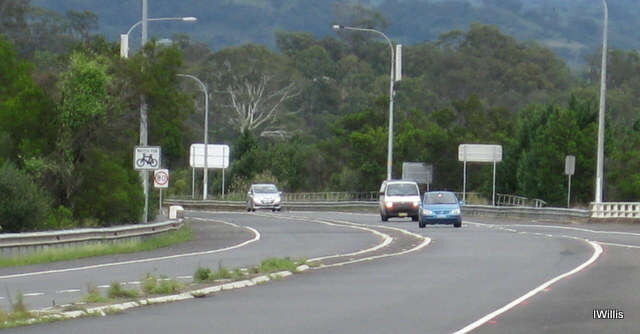 The Great South Road was one of the major civil engineering projects in the Cowpastures district that employed convicts. 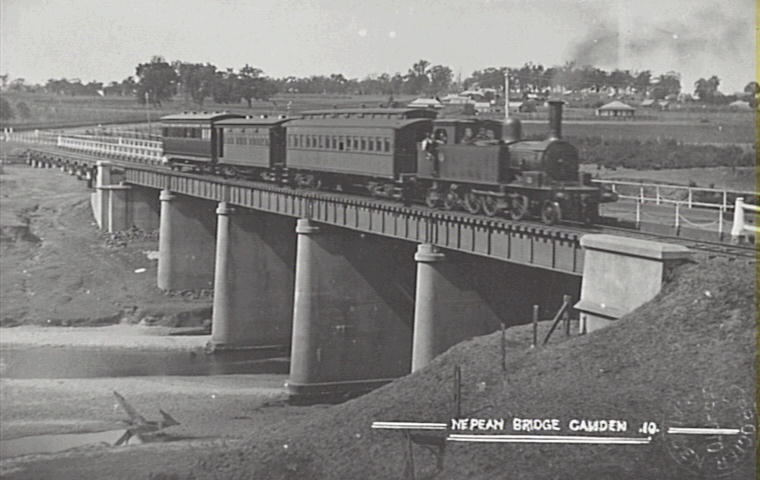 A major bridge (Cowpasture Bridge) was constructed by convicts across the Nepean River mid-way between the river crossings at the Home Farm at Belgenny and the Hassalls at Macquarie Grove. Villy details how the bridge was built by a team of convicts between 1824 and 1826. The construction was supervised by convict Samuel Wainwright, a Cheshire carpenter, who arrived on the Neptune in 1818. Villy lists 24 convicts who worked on the bridge construction between 1827 and 1829. ‘I am aware of the feeling you all have at home about us having so many convicts around us. Your fears, I can assure you are most unfounded’. Elderslie according to Alan Atkinson supported 9 convicts when Oxley sold the grant to Francis Irvine in 1827. At Macquarie Grove under Samual Hassall there were 30 convicts with 3 families of children. Reverend Thomas Hassall who purchased Denbigh in 1826 on the death of Charles Hook had 20 convicts, according to his son James Hassall in his In Old Australia, Records and Reminiscences from 1794. The worked from six in the morning in summer and from eight in winter until sundown. The convicts were managed by a Scottish overseer and they carried out the farming activities on the property. The rations included tea, sugar, meat, flour or when which they ground for themselves on a small steel mill. At the time of the 1828 Census at ‘Kirkham’, which had 54 people including 44 convicts. (SRNSW NRS 1273 1828 Census). A number of members of the Camden Historical Society drew together a database of names of convicts and settlers in the Cowpastures in the early part of the 19th century in the 1990s. The data was drawn from a variety of sources including convict musters. On extracting the names of convicts the following information is now available for a number of gentry properties in the Cowpastures District prior to 1840 and include: Brownlow Hill – 44 convicts between 1823 and 1828. In 1823 there were 11 convicts assigned to Peter Murdoch who had the Glendaural grant, which later became part of Brownlow Hill; Denbigh – 8 convicts in 1828; Kirkham – 103 convicts between 1814 and 1830 with a mix of skill including ploughman, shepherds, millers, and general labourers; Macquarie Grove – 28 convicts in 1828 with skills including ploughman, wheelwright, labourer and house servants; Matavai (Cobbitty) – 14 convicts in 1828 who included blacksmith, sawyer, labourers and house servants; Wivenhoe – 6 convicts in 1828 who included a cooper and shoemaker. The database is located at the Camden Museum. Ken Williams, 1824 Cawdor Bench of Magistrates Population, Land and Stock Book, A Biographical Register of the Inhabitants residing in the Cowpastures, Picton & District Historical and Family History Society, Picton, 2011. Elizabeth Villy, The Old Razorback Road, Life on the Great South Road between Camden and Picton 1830-1930, Rosenberg, Dural, 2011. p. 35. Villy, The Old Razorback Road, pp. 34-35. Villy, The Old Razorback Road.pp. 66-90. The Sydney Morning Herald, Saturday 26 October 1929, p 13. Alan Atkinson, Camden, Farm and Village Life in Early New South Wales, OUP, Melb, 1988, p.20. 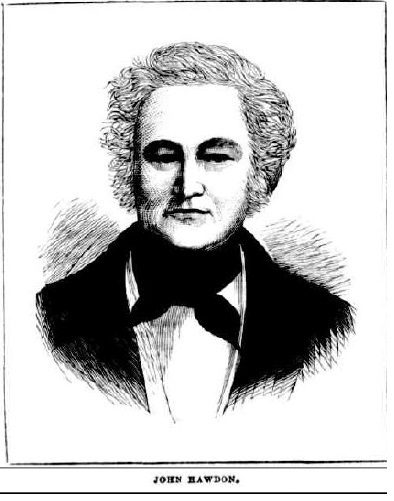 Peter Mylrea, Camden District, A History to the 1840s, Camden Historical Society, 2002, p.34. Camden was not isolated from global trends and cultural forces and the trends around modernism are part of this story. The forces of modernism shaped the world were influenced by industrial growth, the growth of cities and the First World War. The Great War and the Russian Revolution challenged ideas from the past and the failure of the status quo. The senseless slaughter of the First World War challenged the moral authority of progress from the Enlightenment. Many supporters of modernism in Camden and across the world rejected the certainties of the Enlightenment and the dogmas of religious belief. Modernism influenced art, music, architecture, social organisation, daily life and the sciences. Major events during this period included the development of the railway, the The Great Exhibition of 1851 in London, the building of engineering structures like the Brooklyn Bridge (1883) and the Eiffel Tower (1889), the innovation of the electric telegraph from 1837, the adoption of standard time by British railway companies from 1845 and the invention of photography. Modern ideas in art also began to appear more frequently in commercials and logos, an early example of which, from 1919, is the famous London Underground logo designed by Edward Johnston. The skyscraper is the archetypal modernist building. There was the emergence of the Bauhaus School and Art Nouveaux. A more sinister reality was emerging on the Continent, in the form of Nazi art and Soviet agit-prop. Only Art Deco, a rather sleek design style aimed at architecture and applied art, expressed any confidence in the future. There was the rise of fascism, the Great Depression and the march towards the Second World War. The period of modernism includes the Victorian period, the Edwardian period and extends to include the interwar period of the 20th century. During the Edwardian period Camden was influenced by the dairy revolution, which saw innovations in the dairy industry. While the economic development and material prosperity of the interwar period was driven by the emerging Burragorang Valley coal industry. Changes in fashion through modernity, including in Camden, were representative of changes and continuities in society. The changes were brought by the Industrial Revolution and the technology that it spawned and probably the greatest of these was the railway and in the 20th century, the motor car. The railways were the greatest revolution of the early modern period and created mass movement of people, regular timetables and triggered the appearance of mass tourism. Steam ships hastened this and Camden folk regularly travelled to the metropolitan centre of the Empire in London. The growth of industrial society and capitalism brought increased wealth and increased leisure time, entertainment and personal freedom. Mass culture clashed with high culture and the First World War brought the horrors of mechanised warfare. Many new pastimes were brought by new inventions that included the bicycle, the movies, the motor car, the wireless, the telegraph, the aeroplane and the milk bar. The popularity of the bicycle gave women increased freedom of movement which was represented by the fashions they wore while cycling. There was the need for increased freedom of movement, a new social force had arrived. Young folk in Camden went to the movies at the Star Empire Theatre and later the Paramount Cinema. They were exposed to the latest fashions in clothing, motor cars and all things American. Icons of early 20th century American culture including the movie stars like Charlie Chaplin and Shirley Temple. The inter-war period fashions saw women freed from the corset and there was the appearance of cosmetics and rayon, which replaced expensive silk. New industrial processes produced ready-to-wear. There were shorter hemlines and shock horror – women showed their legs and wore pants. Consumerism was hastened by the Victorians and really gained momentum during the inter-war period. Social norms were challenged and new ideas created by new technologies drove many changes in the daily life of those living in the Camden district. Camden general stores, like Whitemans and Cliftons, carried goods from all parts of the British Empire for the consumption of the local community. Modernism was a transnational force that embraced the Camden community. The interwar years were a period of transition and increasingly the motor car replaced the horse in town, and on the farm the horse was replaced by the tractor, all of which supported the growing number of garages in the town. The interwar landscape was characterised by personalised service, along with home and farm deliveries by both horse and cart and motor cars. Despite the prosperity of the interwar period the town was still dominated by the colonial gentry and their estates. Apart from their convict labour in the early years, they established a system of class and social relations that ordered daily life in the town from its foundation until after the Second World War. While the townsmen dominated the early period of local government, by Federation the landed gentry had usurped their power and had imposed their political mantra of conservatism on the area. The dominance of the Macarthur’s Camden Park over the local economy during the interwar period was characterised by the construction of the Camden Vale milk processing factory (1926) adjacent to the railway. It was an example of Camden’s industrial modernism. 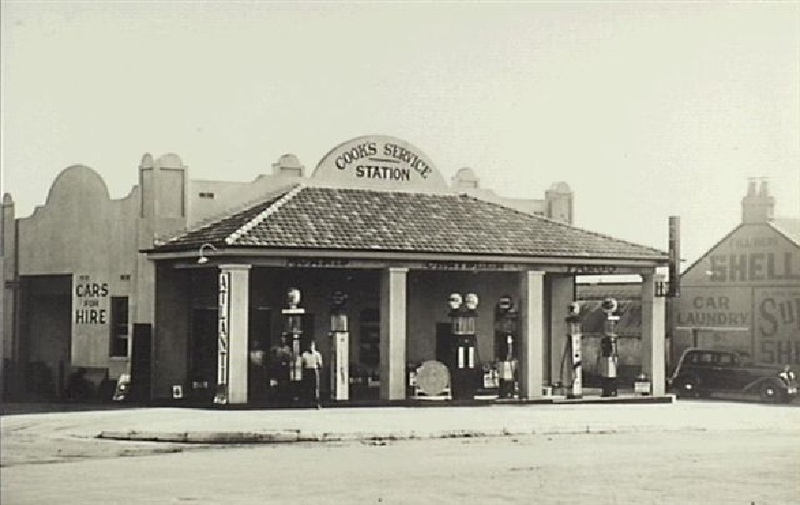 The company developed TB free milk and marketed it through the Camden Vale Milk Bar, a retail outlet on the Hume Highway (1939); complete with a drive-through. For a country town of its size the town had modern facilities and was up-to-date with the latest technology. The town had two weekly newspapers, Camden News and the Camden Advertiser, there was opening of the telephone exchange (1910), the installation of reticulated gas (1912), electricity (1929), replacement of gas street lighting with electric lights (1932) and a sewerage system (1939), and by 1939 the population has increased to 2394. The town’s prosperity allowed the Presbyterians built a new church (1938), while a number of ‘locals’ built solid brick cottages that reflected their confidence in the town’s future. Camden Vale milk processing factory, 11 Argyle Street, Camden. Built in 1926 by the Camden Vale Milk Co, a subsidiary of Camden Park Estate Pty Ltd.
Cooks Garage, 31-33 Argyle Street, Camden. Built in 1935. Owned by WH Cook. It was built in the Spanish Mission style, and was characterised by terracotta roof tiles, a front loggia, rendering of brickwork and shaped parapets. Since demolished. Main Southern Garage, 20-28 Argyle Street, Camden. Built in the mid 1930s. Dunk House, 56-62 Argyle Street, Camden. Built by Harry Willis and Sons, Camden, in 1937. The building was a car showroom, shop complex and professional suites owned by EC Dunk. Clintons Motor Showroom, 16 Argyle Street, Camden. The car showroom was built in 1947 by Mark Jensen for Clinton Motors, the Holden dealership in Camden. 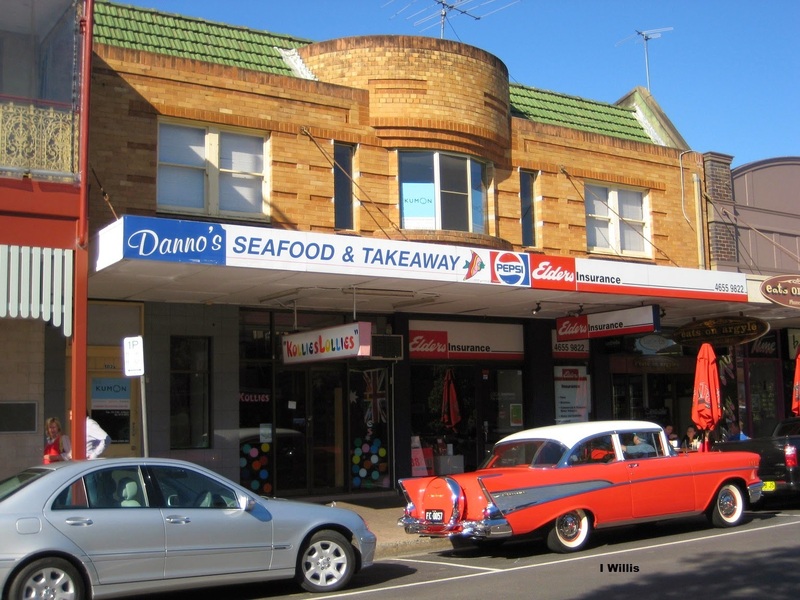 According to the Camden Heritage Inventory it is a rare masonry Art Deco style building with large shopfront windows and wrap around awning. 102-104 Argyle Street, Camden. Built by Harry Willis and Sons, Camden in 1939. 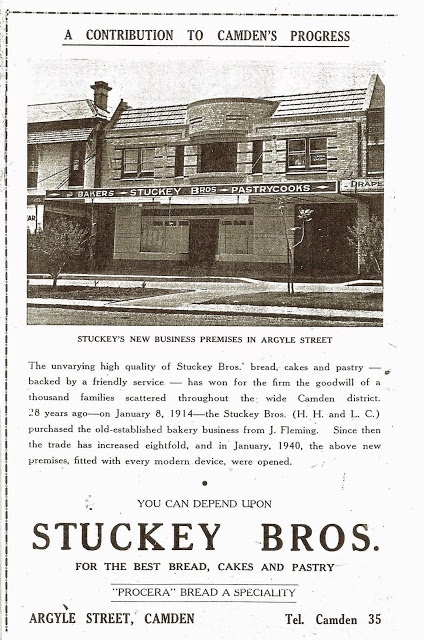 Stuckey Bros, bakers and pastry cooks, occupied premises and fitted it out in 1940. According to the Camden News it was ‘fitted with every modern device’. Bank of New South Wales (Westpac), 121-123 Argyle Street, Camden. Built by Harry Willis and Sons, Camden in 1936. The two storey building had a residence upstairs and a banking chamber downstairs. According to the Camden Heritage Inventory the building is Georgian Revival style. Rural Bank, 115-119Argyle Street, Camden. Built by Harry Willis and Sons, Camden in 1937. The two storey building had a residence upstairs with banking chamber downstairs. Art deco style. There is trachyte stonework on the facing of building. Presbyterian Church, 42 John Street, Camden. Built in 1938. Architect: George Gray, R.Vale. A brick church, which according to the Camden Heritage Inventory the buildings is Gothic Revival (Gothic Interwar) style. 11.Camden Inn (Hotel), 105-107 Argyle Street, Camden. Built by Harry Willis and Sons, Camden in 1933. Tudor style. Front, AH&I Hall , 191-195 Argyle Street, Camden. The brick front of the building was added to the weatherboard hall in 1936. The original hall was constructed in 1899 by George Furner for JW Macarthur Onslow as a drill hall for the Camden Mounted Rifles. Paramount Theatre, 39 Elizabeth Street, Camden. Built in 1933. It was owned by DJ Kennedy who had interests in other suburban movie cinemas in the Sydney area. It was designed in the Spanish Mission style. Cottage, 25 Elizabeth Street, Camden. Built in the 1930s by Mel Peat. Flats, 33 Elizabeth Street, Camden. Built in 1930. Cottages, 1-3 Menangle Road, Camden. Built between 1924-1925 by Harry Willis and Sons, Camden. According to the Camden Heritage Inventory a group of Californian Bungalows. Methodist Parsonage, 24 Menangle Road, Camden. Built in 1935. Cottage, 26 Menangle Road, Camden. Built by Mel Peat in 1931 for N Freestone. Cottages, 24-28 Murray Street, Camden. Built by Mel Peat in 1937. According to the Camden Heritage Inventory a group of Californian Bungalows. Extension, Camden Hospital, Menangle Road, Camden. Built by Mel Peat in 1939. Bellman Hangers, Camden Airfield, Macquarie Grove Road, Camden. Built in 1941. The Federal Government acquired the airfield from Edward Macarthur Onslow in 1940 for a central flying school under the Empire Air Training Scheme. The hangers were erected by RAAF as temporary accommodation for aircraft. They were designed by NS Bellman in 1936 (UK) as temporary buildings. These include Camden Cafe owned by the Sophios Bros, then the Cassimatis Bros in the 1930s. It became the Capital Cafe in 1935. There was the iconic Camden Valley Inn Milk Bar opened with a great fuss in 1939 on Camden Park estate by the Macarthur Onslow family. Camden has an art-deco style inspired building at 102-104 Argyle Street. It is the 1940 Stuckey Bros Pastrycooks and Bakers building, built by Harry Willis and Sons. The bakery was operated by HH & LC Stuckey and a bakery had been on the site from before 1912, when the Stuckeys purchased the business from J Fleming. The building front is yellow-cream brick called polychrome, meaning a brick with more than one colour. The shop front above street level is finely detailed with curved bricks and bay-style window in the centre of the building. The roof is green tiles. The building is an interesting and unusual example of a two-storey Interwar retail building. The use of decorative polychrome brickwork is unusual for Camden township. It is an attractive example of a commercial building, and while the street level shopfronts have been altered it has not compromised the intergrity of the remainder of the building. Originally the shopfront was tiled with curved glass (bow windows) defining the shop entrance. There was a laneway on the western side (facing the shopfront the right-hand side) with access to the rear of the premises, which now has a retail business located on it. Many Camden Argyle Street laneways have been filled in and are now occupied by retail premises. How many can you pick? The shopfront is the public interface for retail premises and streetscapes. 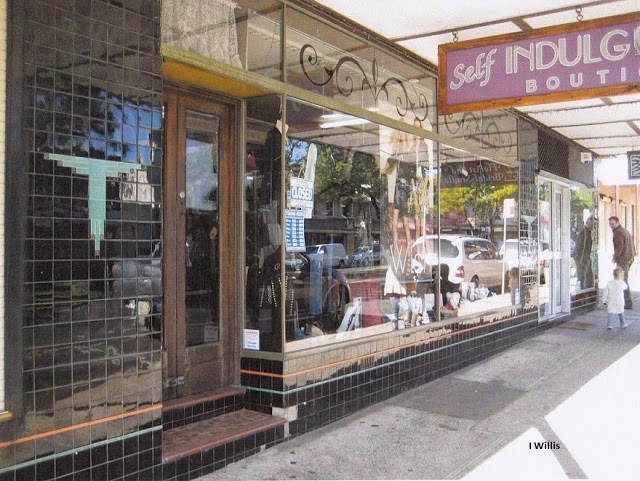 Stuckey Bros original shopfront window glass had metal surrounds and a tiled entry (ingos/outgo or setback) that made it three-dimensional and interesting. A style of shopfront that was common from the Edwardian period. The shopfront awning is still largely as it was in 1940. According to the Camden News Stuckey Bros was fitted out with every ‘modern device’. The shop opened at 6.30am, and the first shop assistant arrived at 8.00am. The shop closed at 7.00pm and operated 6 days a week. The doughmakers came in at 11.00pm and the bakers used wood-fired ovens, which were fired up over the weekends as it took too long to heat them up when cold. Stuckey Bros did home deliveries with a horse and cart to Camden, Elderslie, Cobbitty and Brownlow Hill. The mailmen would take bread to The Oaks, Burragorang Valley, Yerranderie, Werombi, and Orangeville. The Stuckeys kept their horses in the Rectory paddock next to St John’s Church. The Stuckeys were a staunch Methodist family and Beryl Stuckey played the organ at the Methodist Church, while Frank Stuckey was the superintendent of the Sunday School for over 20 years from the 1940s. The site of the Stuckey Bros shop and bakery had been used as a bakery from 1852 when William McEwan built a premises and in the 1890s Mrs McEwan helped her sons Geordy and Alf run the business. Read more @ Frank Stuckey, Our Daily Bread, The Story of Stuckey Bros, Bakers and Pastrycooks of Camden NSW, 1912-1960. Camden, F Stuckey, 1987. Dunk House, A Modern Car Showroom in Camden. There is a building at 56-62 Argyle Street, Camden, which is an understated Art Deco style example of the Interwar period. It is Dunk House. Its integrity is still largely intact and it clearly shows the impact of the new found wealth in the town from the Burragorang coalfields. Dunk House has intact art deco style motifs adjacent to the entry above the display window front. There is black tiling on the shopfront, and a brass surround of the large display window on the former car showroom. The showroom has intact timber flooring and the interior and shopfronts have little changed from the 1930s when the building was erected by its owners. The brass names plates are still attached to the shopfront where the tenant business would put their name plate. The Dunk House was built by renowned Camden builder Harry Willis & Sons in 1937. The premises was a car showroom, shopping complex and professional suites owned by EC Dunk. Downstairs there were 3 shops, the largest being a car showroom for General Motors cars. Upstairs there were 8 ‘compartments’ or rooms or what we would not call professional suites, each fitted out with modern amenities which included water, wash basin and electric light. The tenants in 1937 included the downstairs shopfront leased by L Lakin, grocer and Mr Boulous, mercer. Later they included JL Hogg, dentist and in the 1950s dentist Newton Tobrett. At the rear of the property there a series of sheds which operated at auction rooms run by the Dunks. 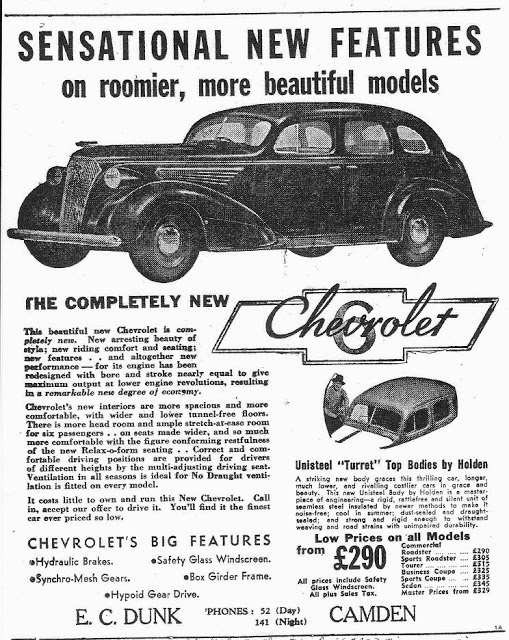 In 1938 EC Dunk was the Camden agent for General Motors Chevrolet cars. One of the notable attractions in the local area in the 1950s-1990s was the drive in movie theatre, which was located on Morshead Road, Narellan (now Narellan Vale). Along with rock ‘n roll, transistor radios, the bikini, the mini-skirt, it defined the lifestyle of the baby boomers. It was as popular with teenagers as it was with young families. It was a defining moment for a 20th century culture that was based around the icons of the period: cars and movies. The drive in at Narellan was owned and operated from 1967-1992 by EJ Frazer and operated as the Gayline Drive in Movie Theatre. There are a number of ranch style houses in the Elderslie area along Macarthur Road and River Road in particular. Some are brick, while others are timber construction. Ranch-style housing is a significant post-Second World War housing style. The housing style has been noted by architect Robert Irving as an Australian domestic architecture style. Parramatta City Council has recognised the housing style of heritage significance. The integrity of the residence was intact until it was demolished in 2011, including the front fence that was built in 1960 by the Hennings of ‘Chromatex’ bricks. There were a number of mature trees on the site that added to the aesthetic quality of the site. 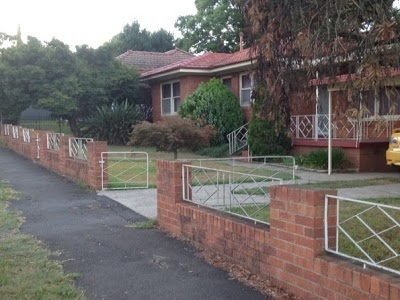 In 2011 a ranch-style house in Macarthur Road Elderslie was unfortunately demolished to make way for a pre-school. 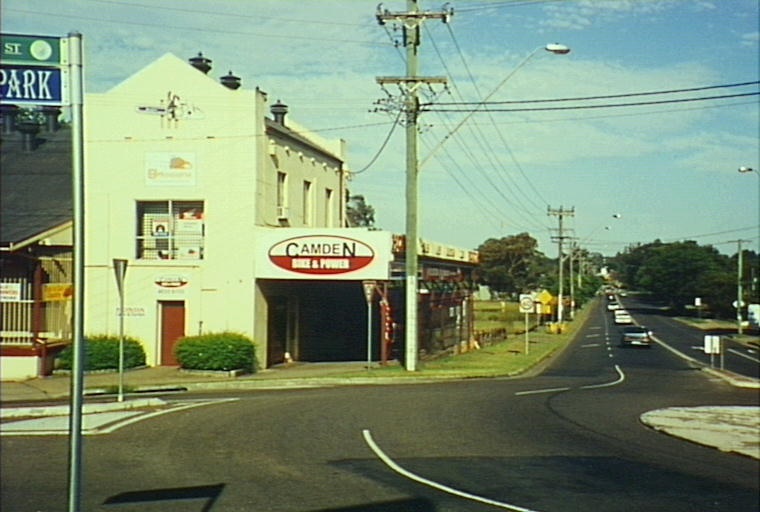 Camden’s ranch-style houses are part of the town’s post-Second World War development and growth. The Macarthur Road house was one of a number in the Elderslie area and two of these have been demolished. 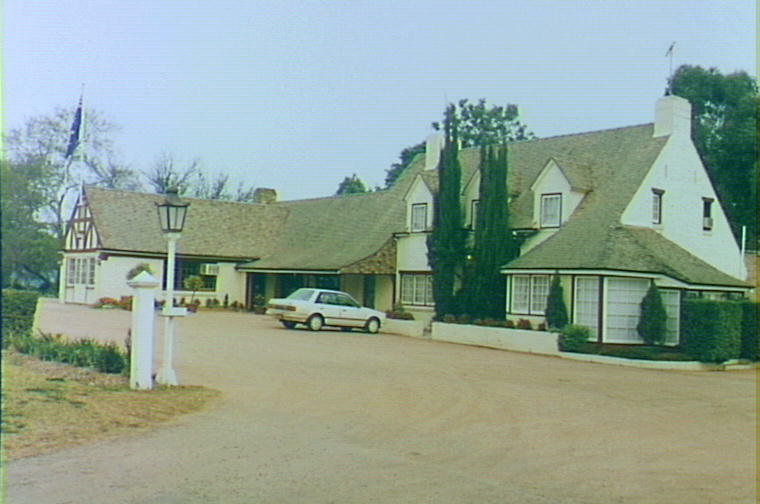 One of the demolished ranch-style houses, Kalinda, was located off Lodges Road Elderslie and owned by the Whiteman family. 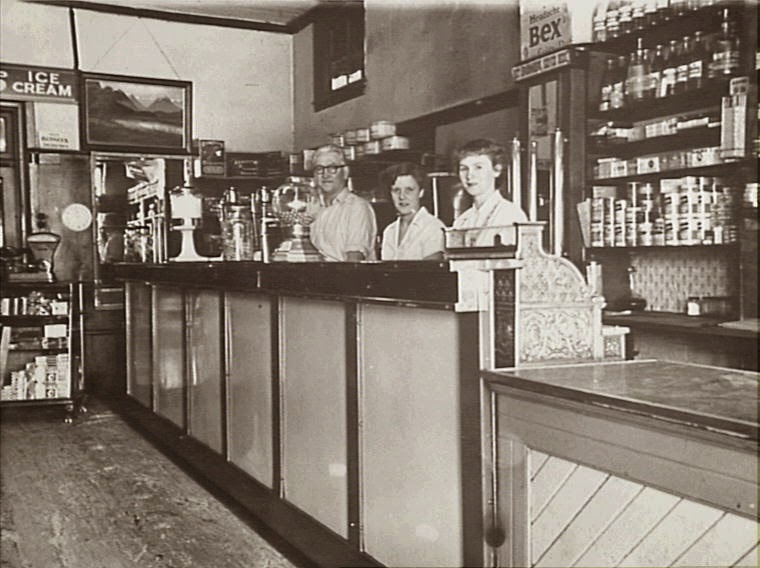 The Whitemans owned a general store in Camden that operated for nearly a century. The house was a weatherboard cottage and demolished in late 1990s to make way for Sydney’s urban development in the Elderslie area. The house was located high on the ridge with a pleasant outlook facing west over the Narellan Creek floodplain. Visitors approached the house from Lodges Road by driving up to the top of the ridge along a narrow driveway. Elderslie is a suburb of Camden, the traditional land of the Dharawal people. It lies on the southern end of the Camden Municipality, 62 km southwest of Sydney, on the rural-urban fringe. It is bordered by the Nepean River to the west, Narellan Creek to the north, Camden By-Pass to the south, and Studley Park Golf Course to the east. The population at the 2001 census was 2,638. Under Governor Macquarie’s stewardship, the area now known as Elderslie was the site of a number of smallholder land grants along the Nepean River, made between 1812 and 1815. There was also one large grant given to John Oxley, a member of the colonial gentry, in 1816. He called it ‘Elerslie’, although by 1828 he had changed it to ‘Elderslie’. 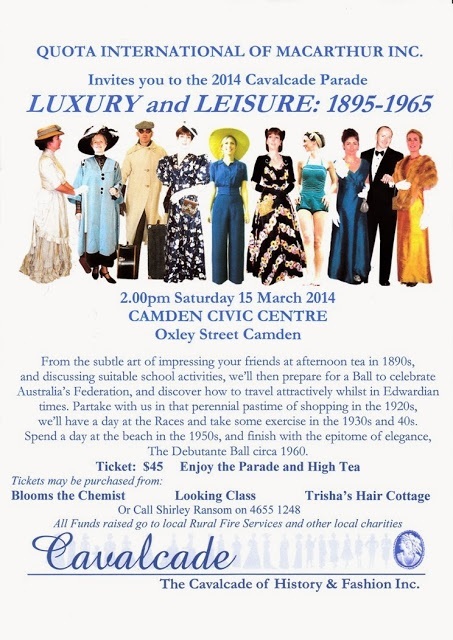 Oxley’s grant was one of the five large estates in the Camden area that used convict labour. Elderslie can lay claim to the first building in the Camden area. 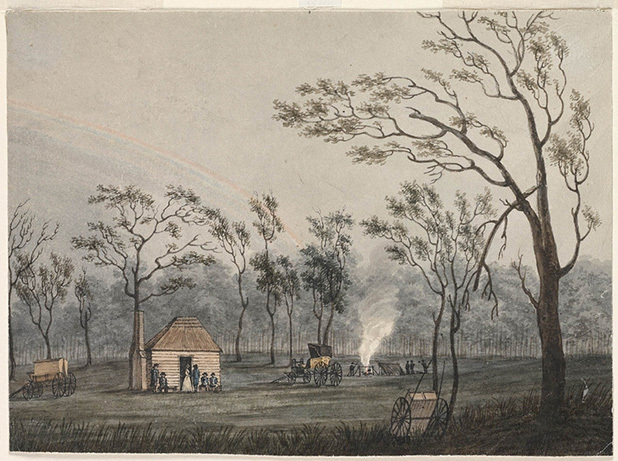 This was a small hut erected at the Nepean River crossing, after the 1803 visit of Governor King, for the government man who looked after the cattle in the Cowpastures. It is reported that the hut was still in existence in 1822.
he village of Elderslie was planned along the Great Northern Road (now Camden Valley Way) with a subdivision and sites for a church, parsonage and market place. A post office was opened in 1839 – and closed in 1841, when it was moved to Camden. A number of village blocks were sold by auction in 1841, but three months after the Elderslie land sales the village was effectively overwhelmed by land sales across the river in Camden. The first church in Elderslie was St Mark’s Anglican Church, built in 1902 of plain timber construction. The church is framed by a huge 150 year old camphor laurel tree, and has only ceased functioning in recent years. Hilsyde is one of the more significant homes in the Elderslie area, and was built in 1888 by Walter Furner, a local builder. 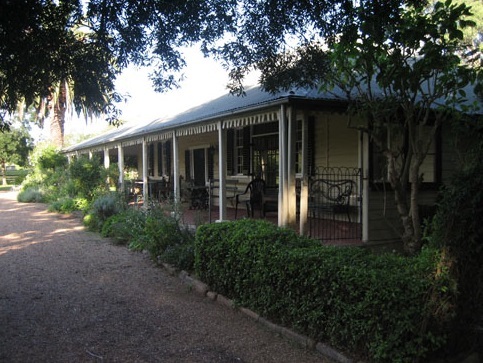 A number of important cottages were owned by the Bruchhauser family, who were viticulturalists and orchardists in the Elderslie area, as were the Fuchs, Thurns, and most recently the Carmagnolas. Viticulture has been re-established at Camden Estate Vineyards on the deep alluvial soils of the Nepean floodplain. There were plantings of mixed varieties in 1975 by Norman Hanckel, and in the 1990s these had been converted completely to Chardonnay, which best suits the soil and climate of the area. Grapes for wine had previously been grown in this location by Martin Thurn, one of the six German vinedressers brought out by the Macarthurs of Camden Park in 1852. Table grapes were grown throughout the Elderslie area and sold in the Sydney markets. Vegetables were grown on the floodplain adjacent to Narellan Creek by Sun Chong Key, who was one of a number of Chinese market gardeners in the Camden area in the first half of the 20th century. Apart from farming, the floodplain and surrounding areas have been subject to extensive sand-mining for the Sydney building industry. Elderslie was the first stop after Camden on the tramway that ran between Camden and Campbelltown, which began operations in 1882. The locomotive (affectionately known as Pansy) had 24 services each week-day, which were a mixture of passenger and goods services. Observant travellers to the area can still make out the earth works of the tramway on the northern side of Camden Valley Way along the floodplain. The tramway operated until 1963, when a number of branch lines in the Sydney area were shut. The tramway, which ran beside the Hume Highway between Elderslie and Camden, was often closed due to flooding. 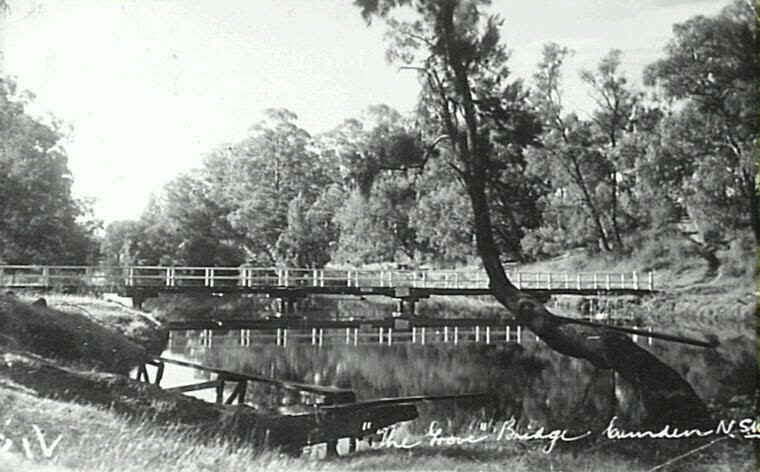 Swimming became one of Elderslie earliest organized sporting activities, after the Nepean River was dammed in 1908 with the construction of the Camden Weir. Water backed up behind the weir for four kilometres through the Elderslie area, and provided relatively deep water suitable for swimming. The ‘Camden Aquatic Sports’ carnival was organized in 1909 and attracted over 1000 spectators, and this was the location of the Camden Swimming Club in the 1920s. There were two popular swimming holes at Kings Bush Reserve and Little Sandy, where the Australian Army built a footbridge during World War II (and there is still one in that location today). By the 1950s, increasing pollution of the river put pressure on authorities for a town swimming pool, which was eventually opened in Camden in 1964. In the 1950s and 1960s, the growth of coal mining contributed to local population growth and demand for residential land releases on farmland adjacent to the floodplain. This created a need for education facilities and led to establishment of Mawarra Primary School (1972) and Elderslie High School (1976). Elderslie was also identified as part of the growth area for Greater Sydney, initially as part of the Macarthur Growth Centre Plan (1973), then the Metropolitan Strategy (1988) and most recently in the Cities for the 21st Century plan (1995). Some of these land releases caused concerns over air quality issues and deteriorating water quality in the Hawkesbury-Nepean River, and consequently they were deferred until 2005. 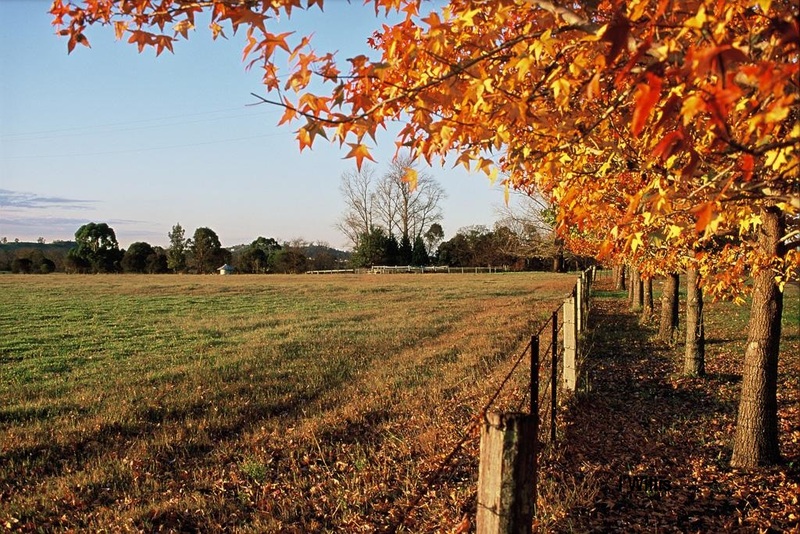 In the most recent Elderslie land releases, developers have commodified the rural mythology and imagery of ‘the country town’ and associated rural vistas, with names like ‘Camden Acres’, ‘The Ridges’ and ‘Vantage Point’. These values have attracted ‘outsiders’ to the area in the hope of finding places where ‘the country still looks like the country’. Part of this imagery is found in Elderslie’s older residential streets, which are a picture in November when the Jacarandas provide a colourful show of purple and mauve. 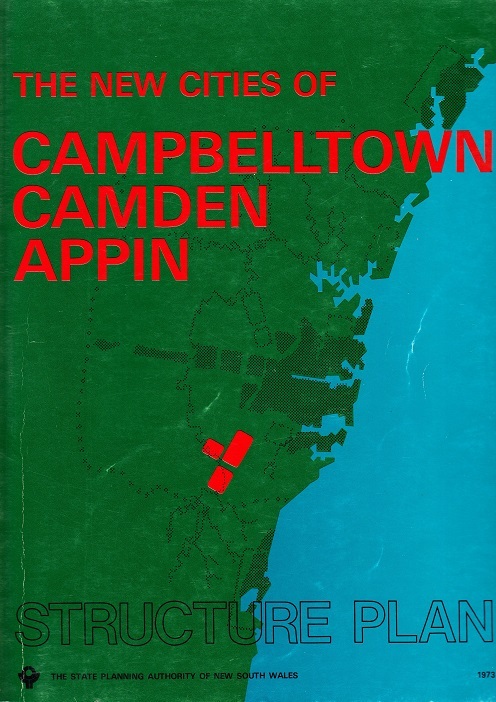 Atkinson, Alan, Camden, Farm and Village Life in Early New South Wales, Melbourne, Oxford University Press, 1988. Mylrea, PJ, Camden District, A History to the 1840s, Camden: Camden Historical Society, 2002. Camden History, Journal of the Camden Historical Society.